Ions | Call Now (1-800-456-0734) | Micron Corp.
What Are Negative and Positive Ions? Very simply an ion is an atom or molecule that has gained or lost an electron. Both positive and negative ions exist in the air. Positive air ions are generally molecules of carbon dioxide that have lost and electron, whereas, a negative air ion is generally a molecule of oxygen that has gained and electron. Negative ions in the air attract particles of pollution and give them a negative charge, making them seek electrical “ground”, which causes them to fall harmlessly to the floor. Nature is constantly producing negative ions to combat the pollution in the air. For example, have you ever noticed how the air is stuffy before a storm and afterwards it is refreshing? This is because lightening produces a high concentration of negative ions, which purifies the air and makes it invigorating. The same is true of waterfalls. When an atom loses or gains an electron, an imbalance occurs. 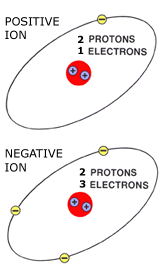 The atom becomes either a positively or negatively charged particle called an ION. These unbalanced charged ION particles are responsible for electron flow (electricity). IONs will take or release an electron to become balanced again.